You must obey the posted parking restrictions, including, but not limited to, restrictions on stopping, loading, and parking from either posted signs or painted curbs [ LAMC 80.73(b)2(B)]. Stay a safe distance away from intersections to avoid obstruction of sight lines. Know the municipalities’ requirements. Trash shall be removed from all areas VISIBLE around the truck. The truck shall take all bags with them when vacating an area. Trash is to include all materials originally dispensed from the truck as well as any other items left by patrons, such as cigarette butts[ LAMC 80.73(b)2(E)]. You must have a CONSPICUOUS litter receptacle which is clearly marked with a sign requesting its use by patrons [ LAMC 80.73(b)2(D)]. In-truck hatch receptacles are NOT sufficient. You must have a health permit for the County (or City if it’s Pasadena or Vernon) you are doing business in. Pasadena and the City of Vernon are not covered under the Los Angeles County Health Permit and require a separate health permit and approval process. There is no smoking on a Mobile Food Facility. Cal Code and LAMC. Some cities require a K-Rated fire extinguisher even if you have an ANSUL fire system. Wash your hands in 100º for at least 15 seconds after every restroom visit, and after handling food directly. Do not handle foods with your bare hands. Do not work when ill. Cool items at the appropriate time intervals. 135º to 70º within two hours, 70º to 41º within 2 hours. Do not cross contaminate your food items. We can provide your office/work space with food trucks. The SoCalMFVA was the first group to organize and bring food trucks to office buildings in Los Angeles. We have continued to schedule food trucks for lunch time service around the Los Angeles area. We ensure that you have a rotating variety of cuisines that offer fast and friendly service. Our scheduling system provides access to an easy to read schedule that keeps your tenants and employees notified. Food trucks at your workplace provide a rotating choice of cuisines to ensure there is always something new to eat. Employees love the variety and the fact they don’t have to leave work to find great food. We’ll work with your office to make sure you get the food trucks and the cuisines of your choice. Our roster of trucks is the largest in Los Angeles so you’re always sure to have something new. If you’re interested in setting up a food truck lot at your office, or place of business, please contact us at socalmfva@gmail.com. Check us out at twitter: @socalmfva and facebook. Los Angeles food truck lots continue to be a popular destination for Los Angelenos. From the one truck lunch lot in front of an office building to the evening event lot in a hip neighborhood, food truck lots provide consumers with a variety of food choices. The consistency of lots provides consumers with some certainty when going out to eat at food trucks. Instead of tracking down your favorite trucks, you can check the schedule at your closest lot. Sure bet that your favorite trucks will make an appearance. One truck lunch lots rotate trucks every day. The rotation provides the Los Angeles workforce with constant variety. Gone are the days of limited cuisine choices in walking distance. Todays hungry workforce has the luxury of having a different cuisine every day. Evening lots typically have five trucks or more. They operate as a weekly, or monthly community event. Communities get to hang with neighbors and friends while enjoying some of the best trucks in the City. 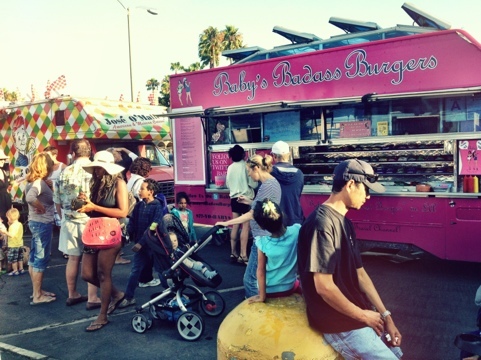 It’s easy to find something for everyone at an evening food truck event. If you’re interested in getting a food truck to your office building everyday, please contact us at socalmfva@gmail.com. We can set up a regular rotation of food trucks at your office building quickly and easily. To see many of the Los Angeles Food Truck lots, go to LOTMOM! Runs daily from Monday through Friday, 11am through 4pm for lunch. This lot runs on Tuesdays for dinner, 5pm to 9pm. 7 food trucks and 1 dessert truck. 5985 W. Century Blvd, Los Angeles CA 90045 Located in the back lot facing 98th St.
Food trucks, a streetscape fixture in other parts of Southern California, can open daily and roam throughout Riverside County after county supervisors eased decades-long limits on the rolling restaurants. The 5-0 vote made Tuesday, Dec. 10, sets up a framework to ensure mobile food vendors follow the latest health regulations as they travel. Cities can restrict where food trucks can go, and they may eventually be barred from Temecula Valley Wine Country and Idyllwild. Since then, the mobile food industry has changed to embrace a foodie culture eager to sample such diverse cuisine as crabmeat tacos, gourmet grilled cheese and bacon-flavored cupcakes from colorful trucks. Two food truck festivals held this year outside the County Administrative Center drew diners who waited in lines that stretched around the parking lot. Leading the push to change food truck rules was Supervisor Kevin Jeffries, who took office in January after promising during his campaign to “free the food trucks.” Allowing food trucks the same flexibility enjoyed elsewhere will boost the economy and give residents more dining choices, said Jeffries, whose district includes most of Riverside, Lake Elsinore and Wildomar. Riverside County is breaking new ground because its trucks will be subject to California’s strict new food-safety standards, Geller said. Trucks will be subject to inspections in the field and will need a permit from the county Department of Environmental Health. There will be a one-year phase-in period allowing trucks to continue operating at festivals while they adjust to the new regulations. The new rules faced opposition from owners of traditional restaurants, who fear food trucks could offer unfair competition by parking near their establishments. 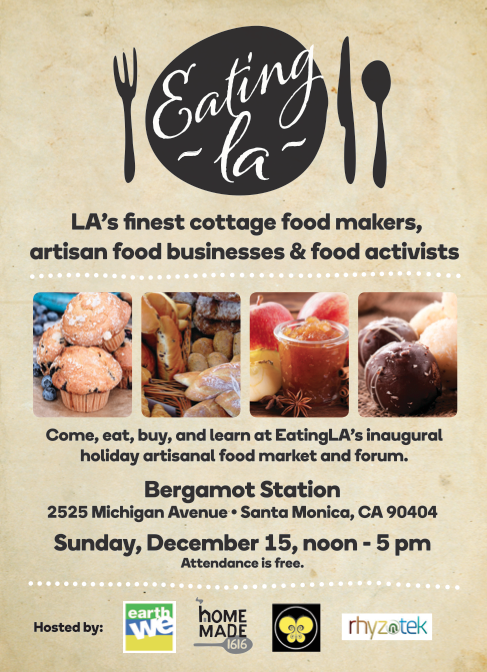 The SoCalMFVA is very excited to be a part of the Eating LA event: 2525 Michigan Ave, Santa Monica 90404 on Sunday, December 15, noon-5pm. The Eating LA marketplace features a variety of handmade delectables by some of LA’s finest cottage and artisan food makers. The forum offers 2 panel discussions (1PM & 3PM) about ways to grow our local food system and features change-makers such as Larry Santoyo (Earthflow Design Works), Rick Nahmias (Food Forward), Elliott Kuhn (Reedley St. Farms & TreePeople), Mud Baron (Muir Ranch), Rafael Quezada (The Waters Wheel), Megan Hanson (RootDownLA), and Erin McMorrow (Kiss the Ground),Matt Geller (SoCal Mobile Food Vendors Assn.) plus restauranteurs and chefs such as Flynn McGarry (teenage protégé and chef of Eureka), Tom Elliott (Venice Alehouse), Stefano De Lorenzo (La Botte Ristorante), Matthew Geller (SoCal Mobile Food Vendors Assn. ), and Cristina Urioste (Rasa Foods). Chef Gino will be cooking with the kids and the Master Food Preservers will teach you how to make preserves at home. Plus, Ray Cirino will be baking pizza in his dragon pizza oven. EarthWE will screen the new documentary Growing Cities at 5:30, so stick around for a movie and popcorn. La Botte Ristorante will offer a special menu that evening highlighting local food from LA’s urban farmers, gleaners, wild-food foragers. 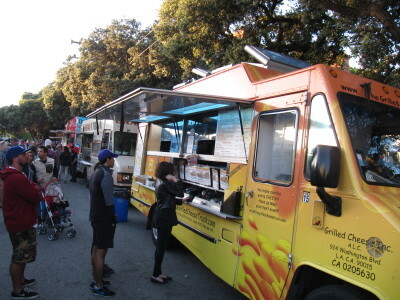 The SoCalMFVA has helped to change anti-food truck laws and policies in over 20 municipalities. We have worked with cities, counties and the State to ensure food trucks are able to do business free from regulatory constraints that are not public safety oriented. Our goals do not stop at making positive regulatory changes. Since January 2010, we’ve tried to answer questions and give support to prospective food truck operators, food truck builders and technology system creators. We’ve reached beyond the borders of California to help other Associations get started nationwide. We’ve lent a helping hand to the trucks of Baton Rouge, DC, Central Ohio, NYC, Philadelphia, New Jersey, Maryland, Minnesota, Chicago to name a few. The SoCalMFVA has successfully run daily and weekly food truck lots for over three and a half years. We do our best to maintain great variety bringing local businesses and communities the best trucks on a regular rotation. The food truck lots have helped make food trucks a mainstay in Los Angeles while providing quality food to hard working Los Angelenos. In an effort to continue making the industry easier, we’re going to provide more support for those that support food truckers. If your business provides quality services to the industry, whether that be goods or services and you’re having issues with regulatory bodies or you just need some guidance, please contact us at socalmfva@gmail.com. If you’re a new truck or a food truck builder and you’re having trouble with the Health Department plan check, please contact us immediately. We can help.